I loved working with my very talented friend, Ryan Bakerink, to create a new logo for his website/brand. He had an idea in his mind what he wanted, and I was excited to bring it to life. I’ve known him for years now, and I think this logo really works. Check out his work – his portrait, music documentary and travel photography makes me swoon! 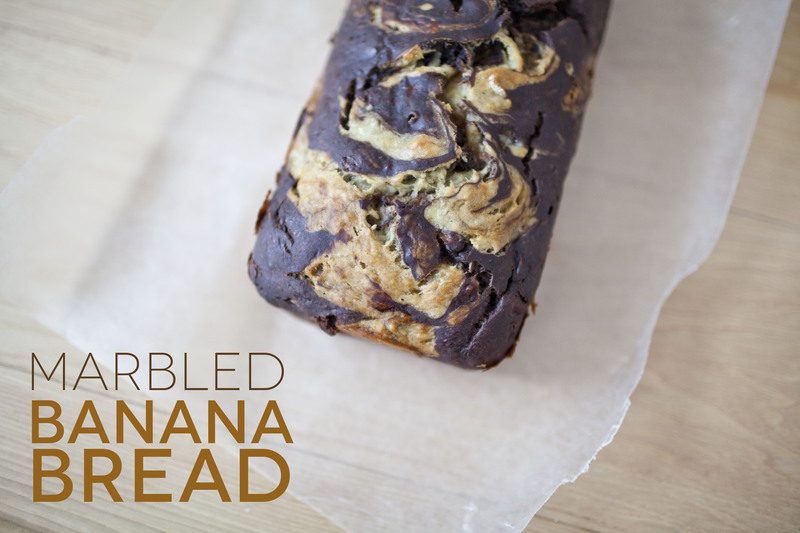 I had some bananas that needed to be used up, so I did a search and found this recipe for a marbeled banana bread. Yum! It was so delicious I made it for my friend’s mom’s birthday and her whole family loved it. They couldn’t believe it was vegan. Prepare boiling water, no need to measure yet. Also, preheat oven to 350 F.
Mash the banana in a large mixing bowl until relatively smooth. Beat in the sugar, canola oil, milk and vanilla. Add the flour, baking soda and salt and gently mix just to incorporate. It’s okay if there is some flour still visible, just be careful not to overmix at this point. Scoop one cup of the batter up and transfer it to a separate mixing bowl. Now, in a small tea cup mix the cocoa powder with 3 tablespoons boiling water and stir vigorously with a fork until the chocolate is dissolved. Add this chocolate mixture to the one cup of banana and mix until the chocolate is thoroughly smooth and incorporated. Now back to the original plain banana batter; add 3 tablespoons of boiling water and mix the batter just until relatively smooth. Lightly grease an 8×4 loaf pan. Scoop alternate 1/2 cupfuls of chocolate/banana batter into the loaf pan. Nothing has to be precise here, in fact, the more random, the better. Once all of the batter is in, take a butter knife and swirl it through the batter in circular directions for about 10 seconds. Bake for 55 minutes. Use a butter knife to test for doneness. Let cool and enjoy! 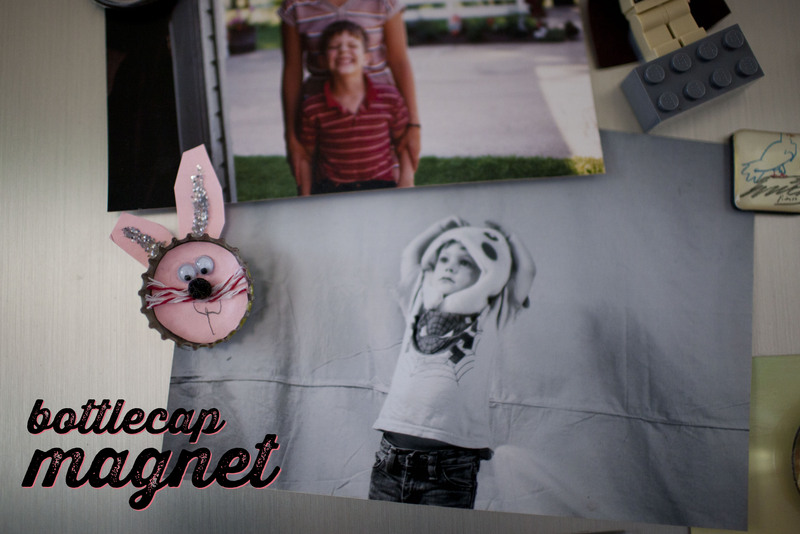 Milo loves easter, and who isn’t ready for spring… so we kicked off this spring season with a simple little craft using bottle caps and some construction paper. I did the measuring, he did the gluing and cutting. It was great team work. when it was all done, we hot glued a magnet to the back and viola! Bring on the bunnies and the sunshine! I had almost a whole can of crushed pineapple and I needed something to do with it. After a quick search on pinterest, I found this recipe and modified it and made these delicious muffins. They tasted like sunshine! Now if only some of that spring sunshine would make an appearance! 1) Preheat oven to 400 degrees F. Prepare your muffin pan and set aside. 2) In a large bowl, combine flour, sugar, baking powder, baking soda, salt, cinnamon, ginger and nutmeg. 3) In a medium bowl combine oil, flax and water, almond milk, vanilla, carrots, orange zest and pineapple. Stir to combine. 4) Add liquid mixture to flour mixture and combine briefly with wire whisk. Stir in chopped nuts. 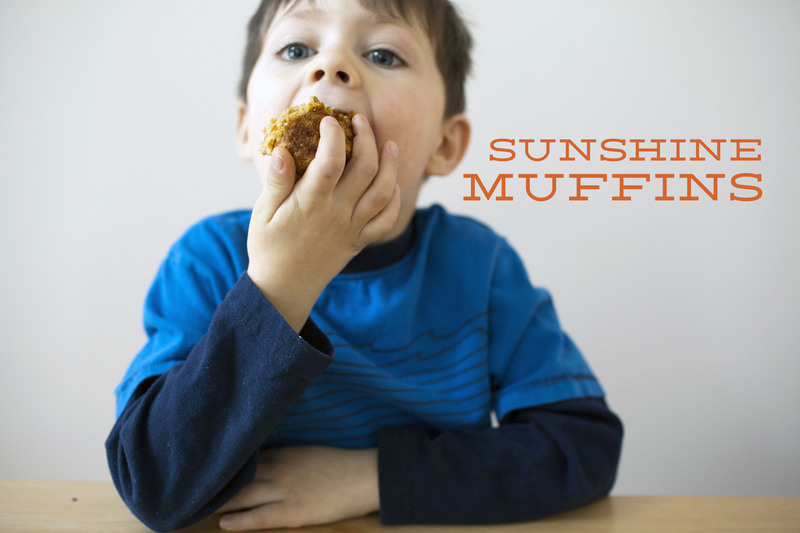 Fill muffin cups to top. Bake for 5 minutes. Reduce oven temperature to 350 degrees F. and bake for about 20 minutes longer, or until a toothpick inserted in the center of a muffin comes out clean. Turn the muffins out onto a wire rack. When completely cool, store in an airtight container. I really didn’t know what to think of these brownies when I saw them. 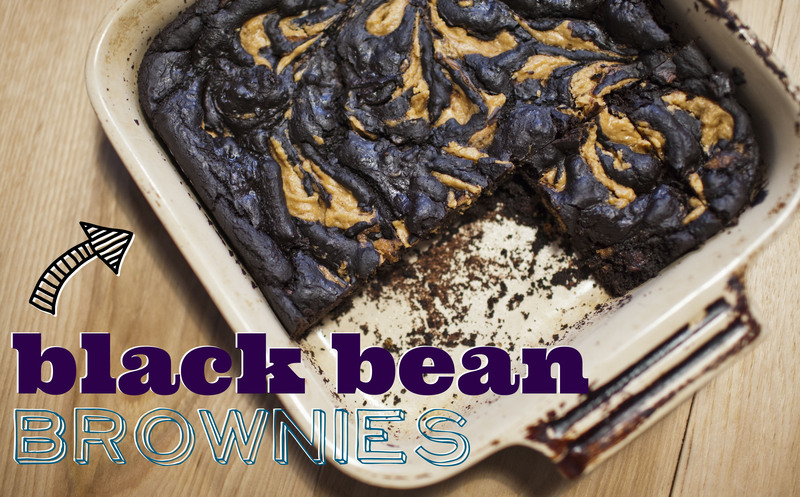 I’ve successfully baked with beets before, but I wasn’t sure how black beans would work… Plus, I have a hard time with vegan brownies in general. they either turn out way too cake like or they have TONS of oil in them. Well, what do you know? Black bean brownies turned out pretty good! I will say these are pretty rich and have a deep chocolatey flavor. They don’t have a ton of sweetener to them, so you really taste the richness of the cocoa powder. If you like dark chocolate these are definitely for you. The peanut butter really helps balance that, so don’t skimp on that! and extra bonus, they are gluten free! i don’t have very many gluten free recipes on hand, especially when it comes to baking – so it’ll be good to keep this one in mind when the time arises. Plus, it’ll be super fun to tell people they just ate brownies…with beans in them! original recipe and instructions found here. So this is my 500th post on this blog! Hard to believe it! That sounds pretty crazy!! I wish I had something a little more exciting than a smoothie to share with you for this milestone, but I was traveling this weekend. But I can promise you this is a delicious smoothie and it definitely helped me turn my ordinary daily smoothie into something a little more extraordinary! I love chai tea, but I tend to stay away from it because it has caffeine. I found some decaffinated kind recently, from tazo, and I’ve been drinking it like its going out of style. Vega makes a chai protein powder that I sometimes use in my smoothie, and its pretty good, buuuuut it still tastes like a protein powder. 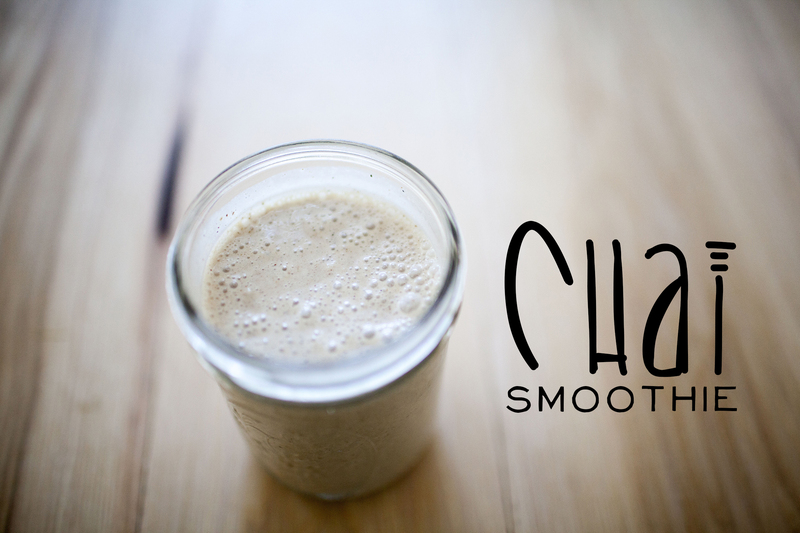 This is a great way to mix up my daily smoothie and bring the spicy-ness of a chai tea. You can make the chia mix ahead of time and store it in a little jar for when you need it. 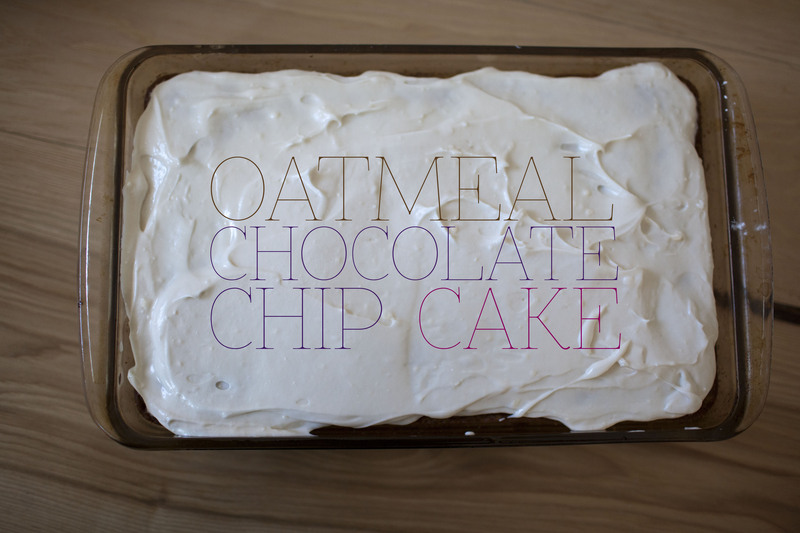 *additions – adding an apple and/or some oatmeal would really help make this a power-packed winner! 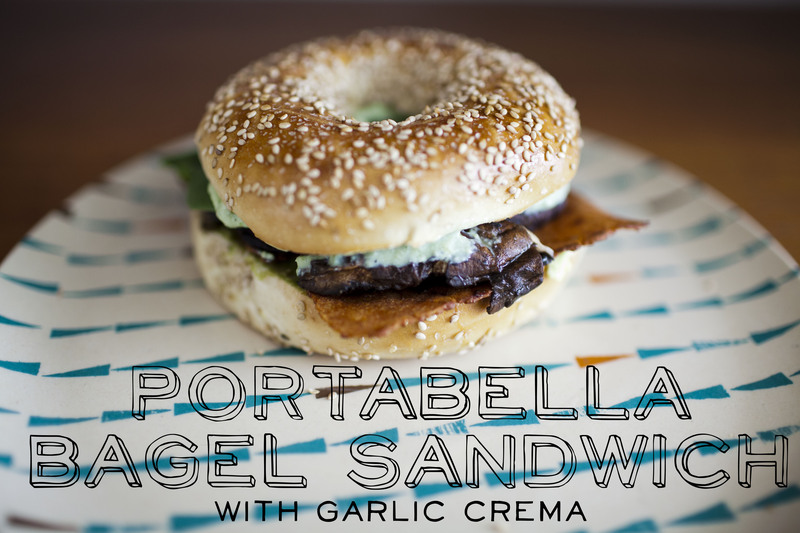 portabella bagel sandwich with garlic creme. Oh, this sandwich….never mind that your breath will smell like garlic for the evening – its totally worth it. For the mushrooms: In a large shallow container whisk together the vinegar, olive oil, mustard, thyme, parsley salt and pepper. Once combined, place the mushrooms in the container and turn a few times to get them coated nicely. Bake in the oven at 400 degrees for about 15 minutes or so. For the garlic cream sauce: Add to a food processor or blender the tofu, garlic, lemon juice, mustard, parsley, salt and pepper. Fry up your uptons bacon, or start making your tempeh bacon. Toast your bagel, add mushroom and bacon – top with lots of garlic creme sauce, spinach, tomato, and avocado! Its messy, but its super tasty! Enjoy!! He was having his friend sleepover for the first time this weekend, so I thought this would be the perfect occasion to bust out the donut pan and give these a go. I have been on the fence about these donut-pan baked donuts. They always taste ok to me, but not like a donut. These are the closest to real donuts I have ever had. They are rich and chocolatey and the glaze sets very nicely. These were gone in no time! This recipe made 10 full size donuts. In a small bowl, whisk together almond milk with the vinegar mixed in, egg replacer, melted earth balance, and vanilla extract until thoroughly combined. Pour the wet ingredients into the dry ingredients and fold together until all of the ingredients are well combined. Use a small spoon to portion batter into the prepared doughnut baking pan. Each doughnut mold should be about two-thirds full. Bake doughnuts for 11 to 13 minutes or until a skewer inserted into one of the doughnuts comes out clean. Remove from the oven. Allow to rest for five minutes before inverting doughnuts onto a wire rack to cool completely. Allow doughnuts to cool completely before glazing. To make the glaze, in a medium bowl whisk together powdered sugar, and cocoa powder. Add 2 tablespoons of almond milk and all of the vanilla extract. Whisk to combine. Mixture may be thick. Add milk, a tablespoon at a time, until the glaze is thick but still pourable. 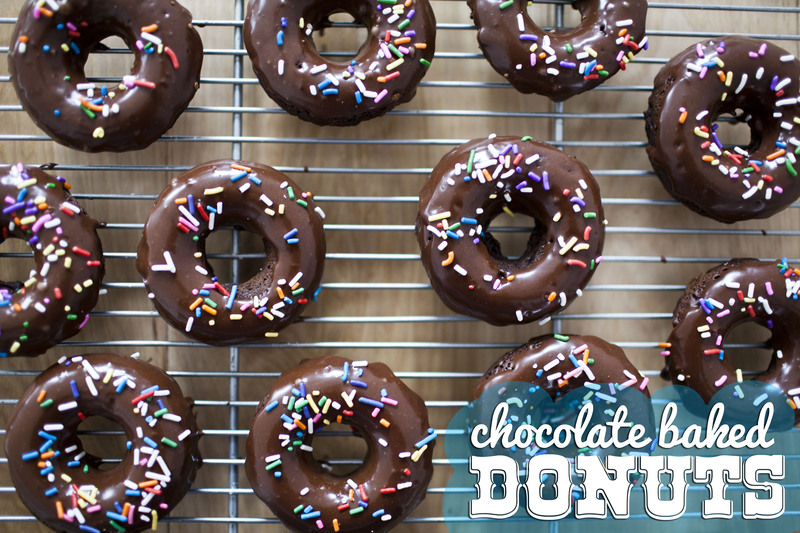 Dip each doughnut into the chocolate glaze. Shake off some of the excess glaze. Return to the wire rack and sprinkle with color jimmies. Allow to rest a few moments for the frosting to harden slightly. This is a great little project to use up some of your fabric scraps. These coasters are placed together in squares, then cut into circles. It’s great practice of sewing along curves too! I definitely plan to make more as I accumulate more scraps. This was my first time doing any kind of quilting, and I have to say, it was quite gratifying. Maybe I’ll take on a little bigger quilting something or other…. Any suggestions for smaller quilting projects? I’d love to see! Here’s what you will need to do for four coasters. Cut 24 3×3 squares out of your fabric. Lay out the squares to decide what order you want them: There will be four used in each coaster. Begin with two squares and sew them together, right sides facing, to form one piece Press open the seam. Sew two more squares together, and press open the seam. Next, pin the two joined pieces together, right sides facing and the seams aligned. 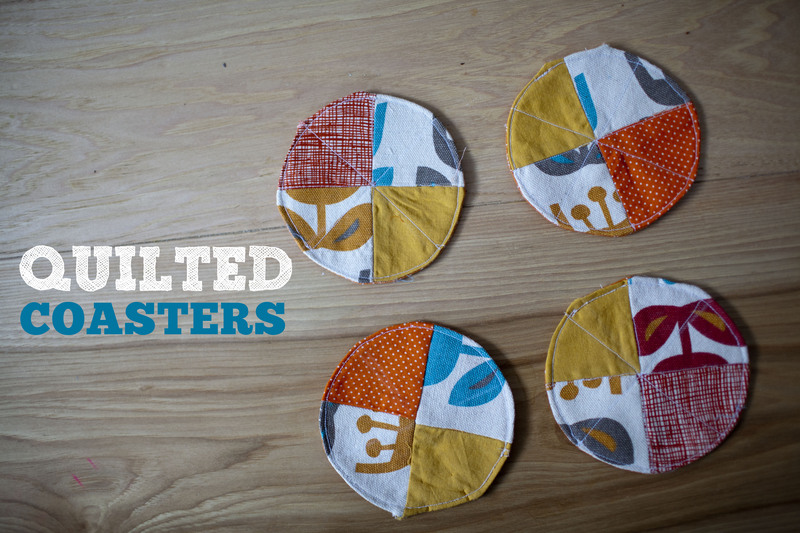 Sew together, to form the coaster top. Press open the seam. Repeat to make three more coaster tops. Sew backing to quilted top piece. With a backing fabric piece and a quilted top piece together, right sides facing, sew around the edge with a 1/4-in, leaving a 1½-in opening to turn the coaster right-side out. Or you can just sew along the line that you drew in the step* above. Be sure to backstitch at the beginning and end of your stitches. Repeat with the other three coasters. Close and topstitch. Turn one coaster right-side out by pulling it gently through the opening. Push out the inner seam so it makes a smooth circular shape. Turn the fabric under at the opening by ¼ in and press flat and pin if necessary. Topstitch around the edge of the coaster, about 1/8 in from the edge, sewing the opening closed and flattening the edges. Repeat to finish the other three coasters.